Does it matter what happens at the cloth beam? Why not let the woven fabric go around the beam as is and forget about it? You have worked diligently at every stage to ensure an even warp. Now, preparing the cloth beam for cloth will ensure the warp remains even. Warping slats cover the cords and knots on the cloth beam so the handwoven fabric has a flat surface to lay against. 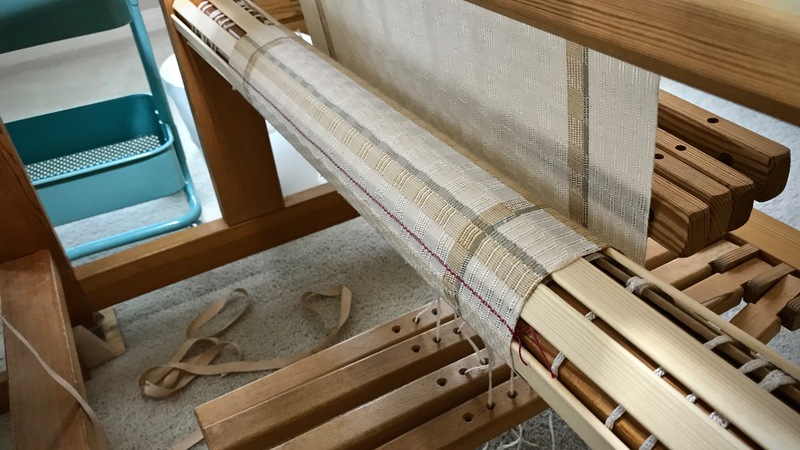 Warping slat over the tie-on bar prevents the tie-on threads from putting bulges in the fabric. Bulges can distort the fabric and put uneven tension on warp ends. When the warping slats have covered one full revolution of the cloth beam, no more slats are needed. 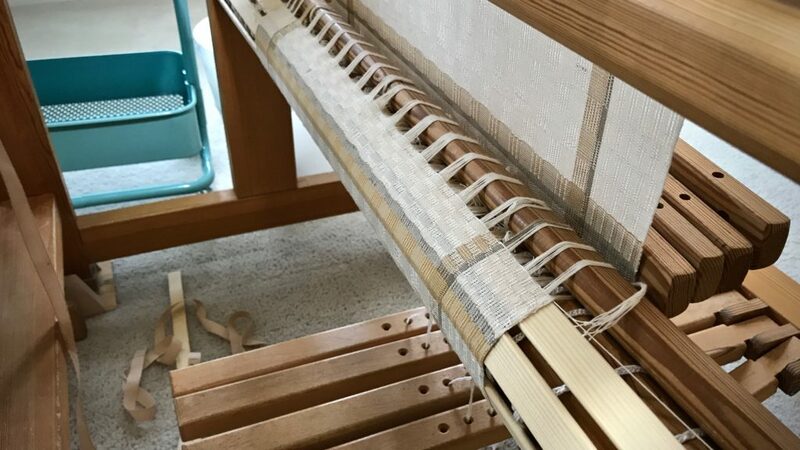 The twill pre-measured tape on the floor gives a clue to the extended length of this table runner on the loom. The cloth beam holds obstacles that threaten the evenness of your warp. 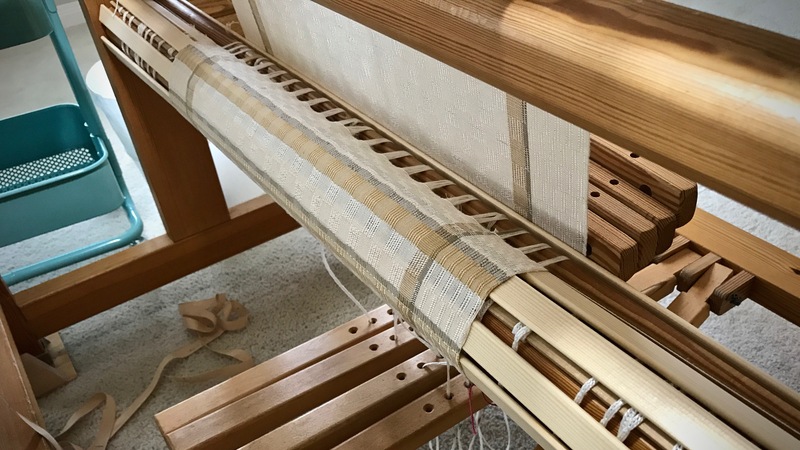 Any raised surface on the beam, like beam cords and tie-on knots, will distort the warp tension as the woven fabric wraps around it. Warping slats solve the problem. I lay in the slats around the beam, one by one, as I advance the warp. This forms a flat surface around which my freshly-woven fabric can hug as the cloth beam turns. Long M’s and O’s table runner on the loom. The sample piece and towel that preceded the table runner have already reached the cloth beam. Fear makes obstacles for our path that disturb our peace and threaten our well-being. Trust in the Lord. Trust pushes fear aside. The day you are afraid–the moment you are afraid–put your trust in God. Know that the Lord is for you. Your trust in Him forms a firm layer to build your life on. Like the warping slats that are in place for your handwoven cloth, your trust in God is a foundation on which to roll the fabric of your life. May you walk without fear. Hi Ellen, I do keep the warp under tension. I don’t see a need to completely loosen the warp at the end of a session. If I know I may not get back to it for a few days, I may loosen the warp a little, but there is always adequate tension on the warp for slats to stay in place. I have also left a warp under tight tension for days or weeks, and have never noticed an adverse effect. 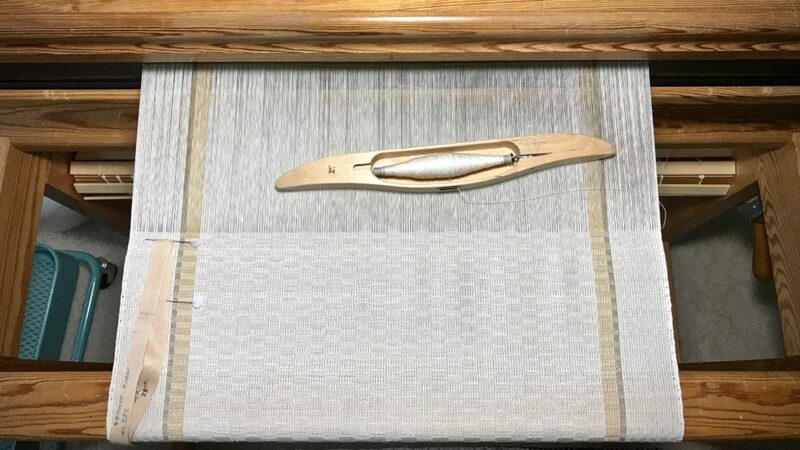 Also, when winding the warp, unless it is linen, I only put in slats every fourth round. So that means if some slats slip, it’s only a few on the outer layer. Do you add slats on the cloth beam as your fabric is woven or just on the initial “round” to cover knots and such? Did your husband make your slats and what is the thickness of the slats you use? I love your sharing of knowledge! So many “little” things that make weaving more of a joy. I add the slats just on the initial round. After that, the fabric just rolls onto itself. My husband did make some of my slats, but most of my slats were purchased from a Glimakra dealer. I think the slats are about 1/8″ thick. Yes, it is the little things that make a difference in the enjoyment and the quality of weaving. What a wonderful message. Love your website. I’m glad you found the message meaningful. And I love having you here!